Yo Yo Yo Mo Fo’s! It’s been a massive ball-ache (Bunster says I need to use more swears!) getting it here in time for Xmas! We may have just done though, but you’ll need to be quick as there’s a very limited supply of this first batch. This lot has actually come from their Amazon stock in the USA. It was becoming a logistical nightmare trying to ship over from Australia directly as it needs to be kept be below 20 degree C (it’s a tad warm Down Under at present what with it being the middle of summer) and the price of cargo space was escalating rapidly as Xmas loomed. Anyway it’s here now so get your soon-to-be-sticky fingers on a bar or 2 of a luxuriously decadent chilli chocolate that is so hot – it will melt in the mouth and then swiftly melt your insides. A gorgeous velvety smooth Belgian chocolate, blended with whole vanilla bean, coconut oil and a heap of Scorpion chilli mean this is the world’s first luxury chilli chocolate that is also incredibly hot. Get your hands on a GOLDEN TICKET! 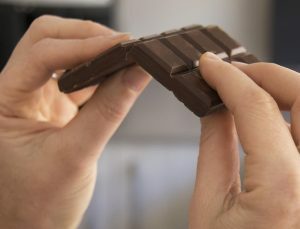 To celebrate the first batch of chilli chocolate Bunster put five golden tickets into five bars of chocolate. 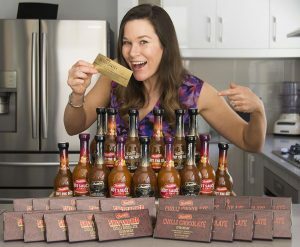 Get the golden ticket in your bar of chocolate and you’ll win your choice of $500 AUD (approx £300) worth of Bunsters Hot Sauce and Chilli Chocolate. Just a quick note that we’re operating a skeleton crew now and over the Christmas period so there may be delays in processing orders. We’ll do our best to get them out as quick as possible but to be sure you receive your goodies for Christmas, UK orders should be placed by Monday 18th Dec for the UK. We may have missed the “defo in time for Christmas” for Europe but if you order now it’ll get shipped out pronto and it should arrive for your New Year’s Eve do. Snap one off with a mate!